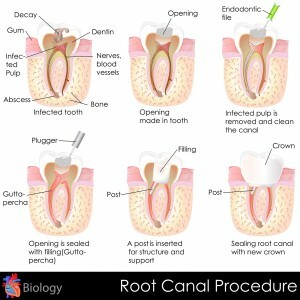 Often simply called a root canal, root canal treatment is one of our endodontic services. Endodontics is the branch of dentistry that treats the dental pulp and tooth nerves located inside of your tooth. This area is delicate and prone to infection if decay reaches it. This infection can be quite painful and eventually cause tooth loss if left untreated. Root canal treatment may be suggested by Dr. Marvin Herschfus, our experienced dentist, stop the pain caused by the infection. The goal of root canal treatment is to remove all of the infected portions of your tooth and restore it with strong, lasting materials. We use local anesthesia to ensure you are comfortable throughout the entire process. After gently removing infected dental pulp, decayed tooth enamel, and restoring the tooth nerves and canals, we will place a strong, rubber-like material inside of your tooth. This is done to restore the integrity of your original tooth structure. We will finally seal the inside of your tooth off with a dental filling or crown, based on your individual needs. To learn more about the benefits of root canal treatment in Berkley, Michigan, we invite you to contact our dental office today. We are happy to help you!